'Painting by Sir John Lavery for Mrs. McEnery, Kilmoganny' is the catalogue title for this shot from the Poole Collection. 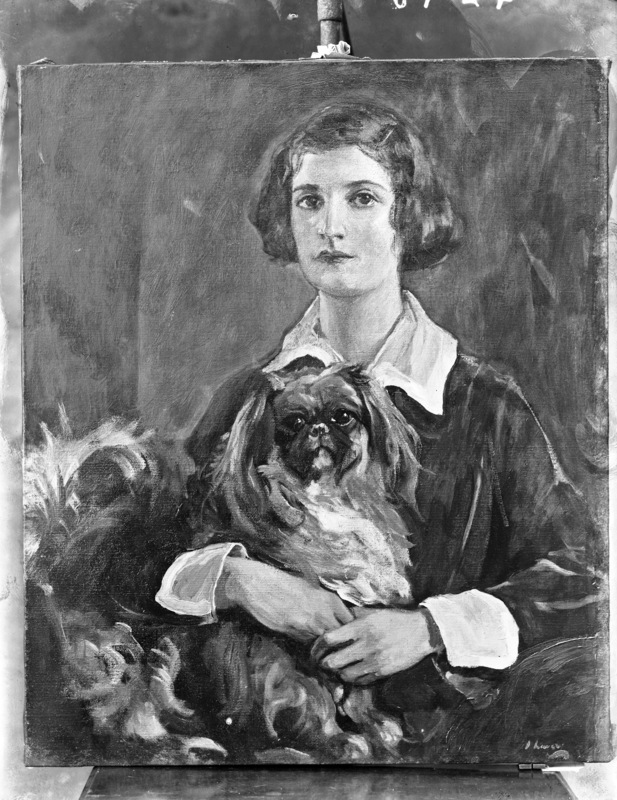 Featuring a dog allowing itself to be held by a young lady it looks a really lovely portrait. I am no dog expert but it appears to me to be a Pekinese which would have been quite uncommon at that time. Who is the subject and can we date the painting itself? There were 10 McEnerys in Kilmaganny Co. Kilkenny in the 1911 census. Mrs. Margaret McEnery had at least 6 daughters, census does not record a little dog. Here is Rossenara House at the NIAH. [https://www.flickr.com/photos/gnmcauley] The wiki article also mentions: with her he had one step-daughter, Alice Trudeau (Mrs. Jack McEnery). So Lavery's 2nd wife Hazel had a daughter Alice who married Jack McEnery. Jack is presumably the 17 year old John in the 1911 census, so we are some years after that. On Alice's wedding: The March 5, 1930 New York Times, covered her wedding in Cannes, France, so we are probably after that. [https://www.flickr.com/photos/beachcomberaustralia] The little one in that pic is Alice, who grows up and marries Jack, which is how Lavery meets the McEnerys. In 1941 Alice's uncle wrote to her: I was indeed terribly interested to hear what a large family you have raised and how well they are divided as regards boys and girls. Children: Martyn, Mary, Robin and Jacqueline McEnery Could this be Mary, aged perhaps 9? Or is it Alice, here shown in 1919 aged 15? "John painted a wonderful painting of Alice, Jack and the family in Rossenarra House. Kilmoganny in 1935"
A photograph of a painting of Dog, Is better than no Dog at all!! I am going to guess that this is Alice, painted by Lavery when she was young. Many years later, Alice (now Mrs. McEnery) has Poole photograph the painting.